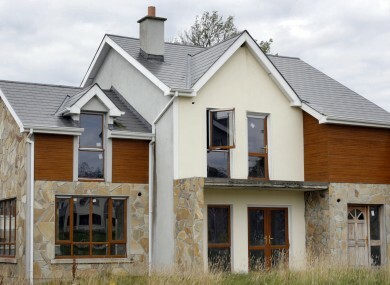 File photo of an unoccupied house in Co Leitrim. THERE WERE 289,451 vacant dwellings around Ireland at the time of Census 2011 – 14.5 per cent of all housing stock in the state. Of these, over 59,000 were holiday homes. The majority of the remaining 230,056 dwellings were vacant houses (73.2 per cent), with unoccupied flats or apartments accounting for over a quarter of empty dwellings in April 2011. Most of the vacant houses were recorded in rural areas (as shown in the map below), particularly in the west and north-west. In Waterford city, 15 per cent of dwellings were vacant, according to Census 2011. Meanwhile in Dublin city, one in ten dwellings was vacant, the majority of which were apartments or flats. Connacht had the highest percentage of vacant dwellings at 21.3 per cent, of which 12,232 were holiday homes and 43,005 were vacant houses, flats or apartments. The part of Ulster covered by the census had 22,870 vacant houses, flats and apartments, while Munster had 69,078 and Leinster had 95,103. Co Leitrim had the highest percentage of vacant dwellings, at 30.5 per cent, while Co Donegal had 28.6 per cent. The lowest percentage of vacancies was recorded in South Dublin (5.4 per cent). Overall, the number of vacant dwellings increased, but the vacancy level fell 0.5 per cent on Census 2006. More than one in five vacant properties in Ireland in April 2011 were holiday homes, according to census data collected last year, or 3 per cent of all properties in Ireland. These unoccupied holiday homes accounted for 59,395 dwellings (up from the 49,789 recorded in 2006), and they were mostly concentrated in counties along the southern and western coastlines such as Clare, Wexford, Kerry and Donegal. Wexford registered the highest percentage of vacant properties that were holiday homes (48 per cent). Email “14.5 per cent of dwellings in Ireland vacant in Census 2011”. Feedback on “14.5 per cent of dwellings in Ireland vacant in Census 2011”.